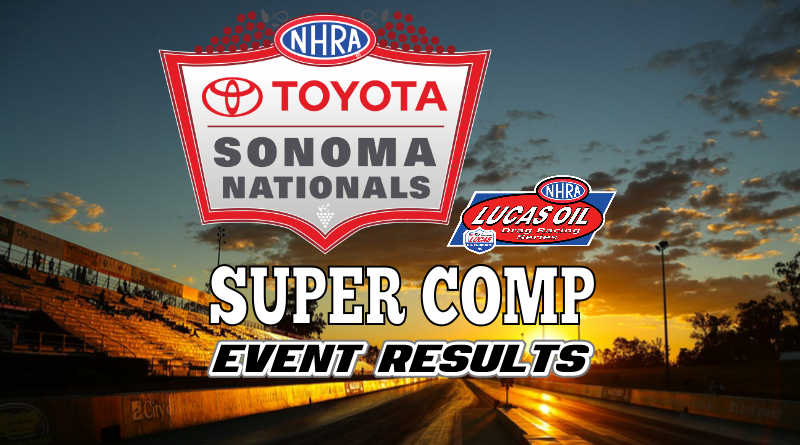 SONOMA, Calif. – Robert Nabor of Ontario, Calif. took home the Super Comp honors at the 2018 NHRA Toyota Sonoma Nationals when he defeated first time national event finalist Matt Woodard of Petaluma, Calif. in the final round. The win boosted Nabor’s national event final round record to five wins in nine finals. Nabor averaged a stellar .015 reaction time throughout eliminations. Nabor’s had a tough draw in the first round in opponent Thomas Bayer. Nabor nailed the tree with .002 R.T. but Bayer was close behind with a .014 light of his own. Both driver’s looked to be holding .03 and at the stripe, Nabor killed three to go dead-on four while Bayer broke out with an 8.881. Nabor stole one in the second round as he missed the tree against seasoned super class star Val Torres. Torres’s .018 to .051 reaction time advantage put him in control of the race although he stumbled at the finish line. Torres, holding .04, dropped hard at the stripe (he killed 24 mph) to take .054 but it was too little too late as he was -.007 under the index. Nabor killed .02 to go 8.914 for the win. After a fortunate win in round two, Nabor drove an excellent race in the third round against Trey Vetter. Nabor left with a .005 R.T. and killed .04 to go 8.914 for the win. Vetter dropped to a dead-on 8.905 E.T. but his .031 reaction time left him mathematically ineligible for the win. The win gave Nabor a bye to the semifinal round. In the semifinals, Nabor took the holeshot with a trip zip reaction time. Reyes was .016 at the tree but quickly developed a throttle stop issue as his car picked up over half a second by the 60′ clocks. Although Reyes was still running about a half a second under the index at 1000′, he somehow managed to drop hard enough to kill 60-plus mph and only take .05 at the stripe. Reyes did a superb job at the finish but Nabor left him no room as his .000 initiated 8.932 (he killed .03) pass was too much for Reyes to overcome. Woodard’s run to the final round began with round one win over Steve Hamilton. Woodard laid down .008 total (.007 R.T., 8.901 E.T.) to force Hamilton into a .06 breakout pass. After a second round bye, Woodard defeated a late-leaving Dave Alves in the third round. Woodard’s .04 holeshot, allowed him to cruise to an off-the-gas .052 over E.T. to take the win. The fourth round looked a lot like the third as Woodard once again took a large holeshot off the line against Greg Krause. Woodard’s .013 to .039 R.T advantage allowed him to kill .03 to go .011 above the index for the win. Woodard’s semifinal opponent was none other than the Terminator, Peter Biondo. Biondo had been killing the tree (.012 average) and had a great racecar under him. Biondo continued his assault on the tree with a great .013 R.T. which gave him a huge holeshot over Woodard’s .040 R.T. At the stripe, Biondo killed .06 to go .034 above the index while giving up the stripe by .0006 to Woodard who drove to a dead-on-the-dial 8.906 E.T. for the win. The super close win propelled Woodard to his first national event final while Biondo had to be disappointed after driving so well all day only to lose by such a small margin. In the final, Woodard once again missed the tree as his .050 R.T. fell way behind Nabor’s excellent .011 R.T. Unlike the previous round, Woodard couldn’t pull out another miracle as Nabor killed .04 to go 8.911 for the win. Woodard killed .03 to go .02 above in the losing effort. Nabor faced tough competition all weekend and came out on top for the win. Congratulations to Robert and his team on their 5th national event win!